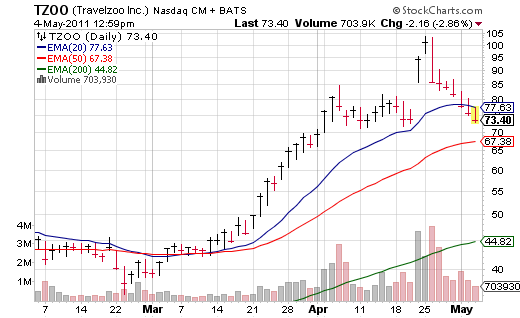 Speaking of filling gaps, I mentioned a week ago Monday that Travelzoo (TZOO) looked poised to short for those who were nimble as the stock was extremely extended over any major support level. For the very nimble there might be a shorting opportunity here… as they say, it is a bit “extended”. Usually when a name moves this far away from any form of support, it comes in…. err, unless it is silver. When I wrote that the stock was just under $103. The next day it opened at a similar price and proceeded to implode down to the mid $80s. It has been down each and every session since then (6 days) and now trades in the $73s. Now to be fair, if I had listened to my own advice and put on any puts or shorted the stock (if I could locate it), I would have covered well in advance of today. Heck a small portion of a portfolio (1%) allocated to puts on a stock that falls from $103 to $85 in one session would bring a wonderful amount of return for very little risk capital offered up for the trade. Bigger picture it is interesting to see a whole host of the “momo” trades falling apart the past 1-1.5 weeks. One wonders if that is signaling something else, as the general indexes hold up quite well.